The Basic Computer Literacy Assessment measures ability to use basic computer skills such as Editing, Passwords, Mousing, Printing, Navigation, Typing, and Windows. The Basic Customer Service Assessment includes questions on topics such as how best to deal with dissatisfied customers, proper telephone skills as well as Customer Service techniques. The Basic Office Manager Assessment includes questions relating to managing staff, measuring employee performance and productivity, and recommending raises and promotions. Checking Assessments ask candidates to compare items to check for a match and are available in formats for Names, Numbers, and Standard Checking which includes names, dates, addresses and more. Coding Assessments ask candidates to select the correct abbreviations or correct button on a telephone list and are available in formats for Names, Numbers, and Standard Coding. The Data Entry set of assessments ask candidates to transcribe information using their computer keyboard. Scores are based on speed and accuracy of input. 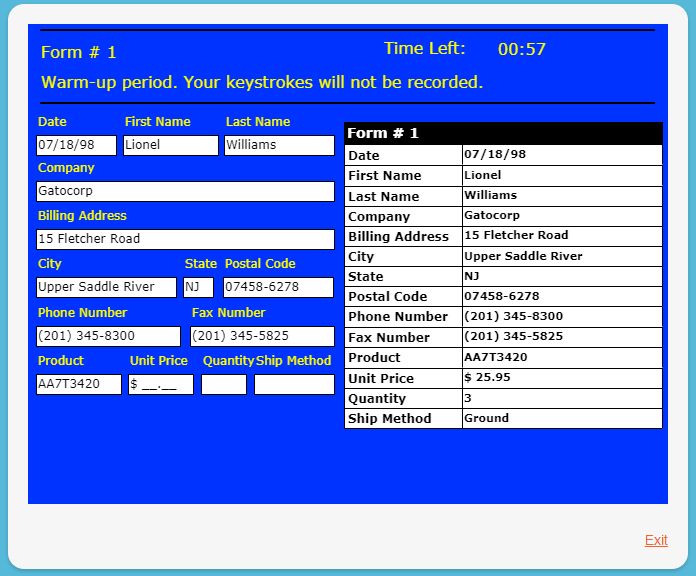 In addition there are audio versions available which ask candidates to listen to simulated calls and type the reuired information into an on-screen form. Data Entry assessments are available in versions for Alphanumeric, Call Center (Audio), Checks, Decimals, Numeric, Sales Leads, Sales Orders, and Standard Audio Data Entry. There are also versions available in Canadian, Australian, New Zealand, South African, and UK English. Covering the areas of Computing, Essentials, Internet, and Software Skills, the Digital Literacy assessments measures ability to utilize computer hardware and software including the ability to identify important hardware components, use of the computer operating system, perform common application functions, and use email and browsing applications, and more. Candidates must select the correct location for filing documents based on data provided such as dates, numbers, names and companies. Filing assessments are available in versions for Names, Numbers, and Standard Filing, and are also available in Australian and UK English. There are grammar assessments available in both the ReviewNet and SkillCheck test libraries. The Business English Literacy Assessment is a 40 question assessment covering the areas of Vocabulary, Grammar, Reading Comprehension, and Listening Skills. The SkillCheck grammar assessments include both standard and business grammar versions in which candidates are asked to select grammatically correct sentences. SkillCheck grammar assessments are also available in French Canadian, South African, and UK English. Candidates are asked to set up a standard letter in either Block, Alternative Block, Letter Head Block, or Semi Block format. Also available in UK English. General Math assessments contain questions that measure commonly used math skills, such as addition, subtraction, multiplication, division and percentages. Candidates are asked to enter the abbreviated names for US States, US Territories and Canadian Provinces. Audio format also available. Candidates must find and highlight 20 errors found in on-screen text. Candidates are asked to read passages and answer questions that require applying understanding of what they have read. The Receptionist Skills assessment contains questions relating to receptionist skills such as recognizing names and faces, taking messages and forwarding calls. Also available in UK English. The Receptionist Skills assessment contains questions relating to secretarial skills such as recognizing names and faces, taking messages, and using judgement and discretion. Also available in UK English. Using pen and paper, candidates transcribe audio into shorthand. Candidates then type their own shorthand notes into the space provided on the computer screen. Shorthand Assessments are available in Accounting, Business, Legal, and Medical versions. Also available in UK English. An assessment that measures skill level with the features of Microsoft Office that enhance the productive use of Office applications (such as shortcut keys and productivity functions such as macros). Spelling assessments are available in general, accounting, business, geography, legal, and medical related spelling variations in which candidates are asked to select the correct spelling of words in general use. 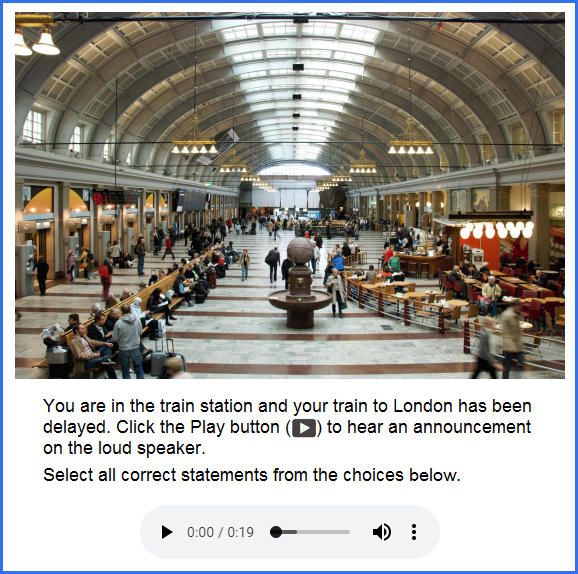 In addition there are audio versions available for both US and International Geography in which candidates listen to audio and are asked to to type the correct spelling of what they hear. Versions are also available for French Canadian, Australian, UK English, South American English, and Spanish. Candidates see a telephone message displayed briefly and are then asked 5 questions relating to the message. This test contains questions relating to basic telephone techniques, manners, judgement and discretion as well as message taking. Candidates are asked to type numerical information using the computer keypad. Scores measure speed and accuracy of input. Candidates type a document that is read aloud. Versions are available in Accounting, Business, Legal and Medical variations. Also available in UK English. Candidates are asked to type text from a copy. Scores measure typing speed and error rate. Versions are available in Standard, Accounting, Banking and Finance, Legal, Medical, Technical, and One Space variations. Also available in Australian, UK English, Dutch, French, German, and Spanish versions. Candidates are asked to select the correct meaning of words. Versions are available for General Use Vocabulary, Accounting/Bookkeeping, Business, Legal, and Medical. Also available in French Canadian and UK English versions.